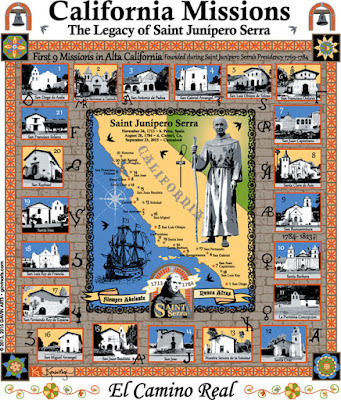 Saint (St.) Junipero Serra Legacy canonization T-shirt design with all California Missions. Kimberleigh Gavin’s “Legacy of Saint (St.) Serra” T-shirt design is now available on line, at Mission San Juan Capistrano and other Missions. Created for Fr. Junipero Serra’s canonization, all California Missions' locations are marked along El Camino Real on a California map that is framed by pictures of each Mission in the order they were founded. Blessed Father (Fr.) Junipero Serra’s Mission Founding Legacy and his September 23, 2015 Canonization to Sainthood are very beautifully and historically portrayed and commemorated on Kimberleigh’s hand created 14-color screened-printed T-shirts and Hooded Sweatshirts. Celebrate the legacy in wearable art! Get your St. Serra T-shirt today! For more information and to order yours now click here.